Much like the Hebrew Samuel, Cooperative Baptist Fellowship field personnel Sam Bandela’s missionary journey began at a young age. Growing up in a small town in South India, Sam never heard the name of Christ until a group of missionaries moved into his hometown for training. Bandela presents a certificate and sewing machine to each graduate of his sewing center, a ministry which trains women to sew to support their families. The missionaries came to Bandela’s town to practice speaking with the people, including his mother and family, in the local language of Telugu. And when Bandela’s mother was diagnosed with cancer, one missionary couple did all they could to help her find healing. While just three years old, he lost his mother to cancer, and the same missionary couple that helped to care for his mother took Bandela in as a child. Seeing so many parallels between his story and Eli’s young apprentice in scripture, the missionaries named him Samuel and made sure that he and his siblings received an education. Bandela’s older brother was the first in his family to become a Christian, and he now serves as pastor of a church in South India. When Bandela finished high school, the missionaries that he had become closest to helped pay for him to go to college. He would later leave India to enroll at North American Baptist Seminary in Sioux Falls, S.D., where he earned his Master of Arts degree in Christian education and Master of Divinity. After working for Habitat for Humanity International and serving as a pastor in New Jersey, Bandela and his late wife, Latha, were commissioned in 1994 as CBF field personnel to start a ministry center in Atlanta. Together, the Bandelas led the ministry to help the Southeast Asian immigrant community in northeast Atlanta, creating jobs for 10 full-time employees and starting a variety of community-based programs. But Bandela eventually felt called to serve God in his own country. In 2000, he took on a new assignment with CBF to minister to unreached and unevangelized people groups in India. During more than a decade of ministry in India, Bandela has provided disaster relief ministry to tsunami survivors, planted numerous churches across South India and established medical clinics in the most remote areas of the country. With a passion for bringing transformation to neglected and marginalized peoples, Bandela has lived into his calling to spread Christ’s love and work to meet the needs of those he ministers to and with. While Bandela has helped meet the pressing needs of many throughout his long ministry, he is most proud of the sewing centers he launched in partnership with Cooperative Baptists to assist widows and teenage girls in supporting their families with dignity and respect. Over the past five years, Bandela’s ministry has put sewing machines in the hands of more than 400 women and taught them to to sew thanks to the generous financial support of CBF churches. With this marketable skill, these women are able to earn a living and avoid becoming trapped in a life of prostitution. Faced with the dire need for these women to find a better way to make a living, Bandela sought to provide training in a marketable skill. Over the past five years, Bandela has been able to put sewing machines in the hands of more than 400 women and teach them to sew, thanks to the generous financial support of CBF churches. These women are now able to support their families. Teaching others about the love of Jesus is one of Bandela’s greatest passions. While his entire ministry is based around sharing Christ’s transformative presence with people through healing and empowerment, he also seeks to start churches throughout India. Through his church planting ministry, Bandela equips lay leaders to become ministers in India. In April, Bandela hosted 50 people for a discipleship training program, challenging each person to live into the Great Commission, to go and make disciples and baptize them. “Right now, my goal is to plant churches,” Bandela added. “Having come from a Hindu family, when I see mosques and Hindu temples on every corner, my desire is for Christians to have a simple, decent and affordable worship place. Bandela notes that India is still a place where many harbor prejudices against Christians, even to the point of persecution. He hopes that, by building churches, people can learn about God in a safe and welcoming environment, and help to lessen the stigma around Christianity. 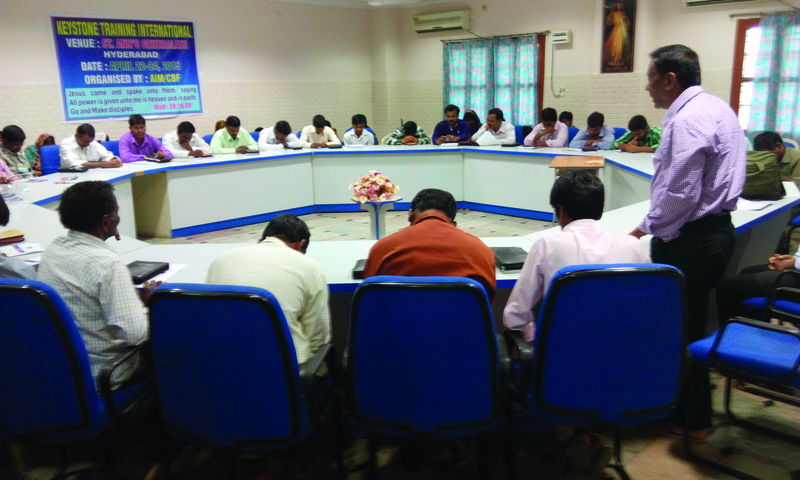 To provide solidarity and encouragement for the Christian churches in India, Bandela is asking CBF churches to adopt Indian churches as sister congregations. In April, Bandela hosted 50 men and women for a discipleship training program in Hyderabad, challenging participants to live into the Great Commission–to go and make disciples and to Baptize them. The CBF Offering for Global Missions is the foundational means of support for Bandela. Gifts to the Offering provide Bandela and other field personnel access to a wide array of tools and resources to serve people and equip churches. You may give online at http://www.cbf.net/OGM. One of the many reasons I am glad to be associated with the Cooperative Baptist Fellowship.